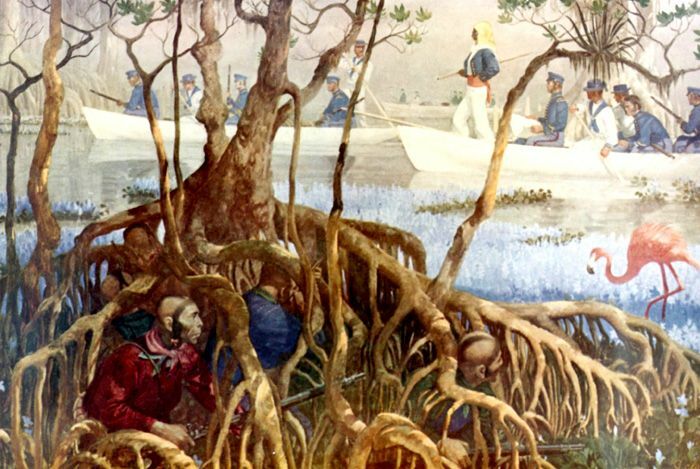 Much of the fighting during the Seminole Wars were fought in the swamps of Florida. During the Second Seminole Indian War (1835-42), a number of military forts were constructed in Florida to serve as supply bases and house the troops. Near the site where Fort Armstrong would be built, the Battle of Wahoo Swamp occurred on November 21, 1836. On this date, a force of 2,500 soldiers, including a Florida Cavalry unit, a U.S. Artillery Battalion, a group of Tennessee Volunteers and several hundred Creek Indians, who had enlisted in the U.S. Army, launched an attack on a Seminole force of between 500 and 600 warriors holed up in Wahoo Swamp. The American commander, Brigadier General Richard Keith Call, mishandled the attack, resulting in an embarrassing defeat where his troops suffered 25 casualties, with nine being killed. The Indians left 10 on the field. General Call was then relieved of his command and replaced by General Thomas Sidney Jesup. Immediately after the battle, the US Army built Fort Armstrong to guard this section of the Fort King Trail. A detachment of men, many of whom had fought in the Battle of Wahoo Swamp, under the command of Major Robert Armstrong, built the fort about a half mile from the site of the Dade Massacre, which had occurred the year before. There are no remains of Fort Armstrong today, but a historical marker can be found on County Route 476, between County Roads 603 and 605, near Bushnell, Florida in Sumter County.